So you want to write a chord progression on guitar but don't know which chords will go together? 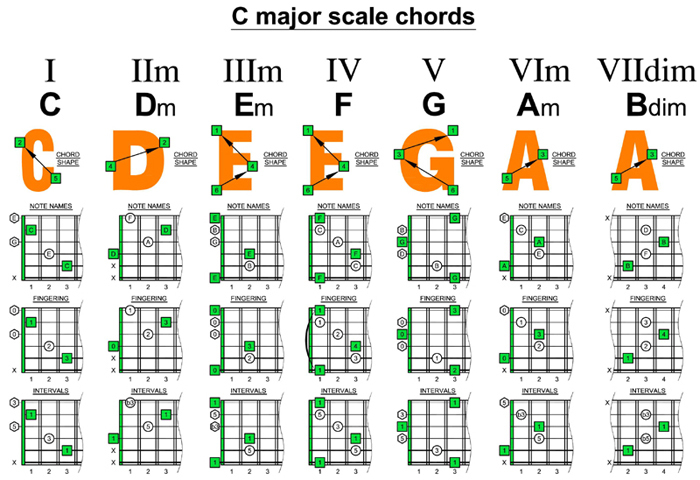 Every major scale generates a predictable series of chords (built using a mixture of major and minor third intervals); with the simplest having 3 notes (triads) and the most complicated using all 7 notes of the major scale (thirteenths). The simplest major scale, from a note naming point of view, is C major because it has ZERO sharp (♯) or flat (♭) notes. F, A, C – F major; G, B, D – G major; A, C, E – A minor; B, D, F – B diminished. Below are the easiest shapes for the chords in the key of C major - these may not be the most inspiring but they will always go together - in any order. Try a few together and listen to what they sound like. 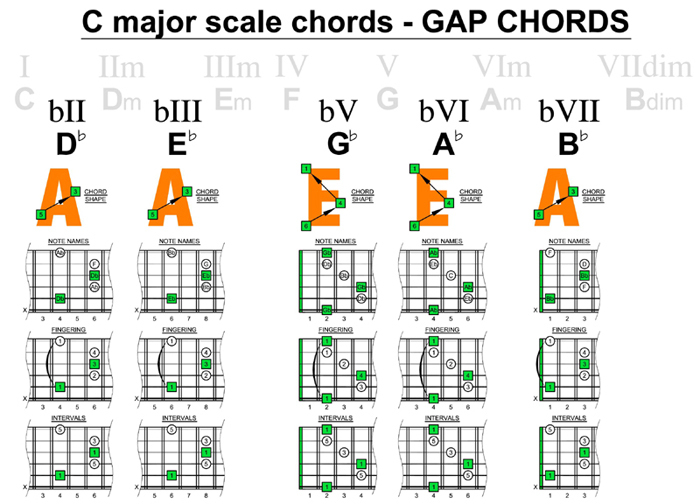 Sticking to the C major scale generated chords (staying in key) can get a little tiresome so below is a table of GAP CHORDS i.e. a series of major chords built on the notes that lie in-between the scale notes. Some sound good in combination with the scale chords - others are at best an acquired taste - again try out a few combinations and see how they sound together.